HCL, Indian-based software development and IT services providing company, which has key offices in India across globe and has workforce of more than 90000. 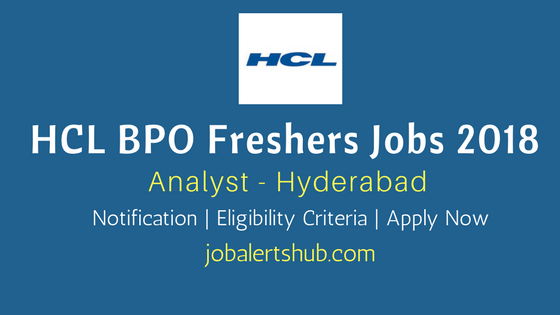 Announced HCL BPO 2018 Freshers Recruitment vacancies for B.Tech graduates for Product Support Engineer role for work on HCL BServ for Hyderabad location. Engineering graduates who have no backlogs will be preferred for the post. And both Freshers and Experience alike can apply for the vacancy. Beside educational qualification, applicants who have knowledge and expertise in Web Development, E-mail and chat support and Customer support experience will be given priority over others. The job responsibility as Analyst a Product Support Engineer, involves troubleshooting web code implementation, ad serving issues and provide email and chat support in English. Selected candidate for the vacancy will be brought under company payroll, permanent employment. Also Read: Latest Accenture IT & BPO Job Updates. Qualification: Graduation in Engineering preferred (No Backlogs). - Excellent communication Skills in English both verbal and non-verbal. For more key skills announced for the post, applicant requested to check from online job application link provided below. How To Apply: Interested candidate need to share their resume to recruiter mail id mentioned in the application link. And applicant need to go through job requisite details shared in the job link to check if he/she qualified to apply for the post. And also can reach out to recruiter phone number on announced timings to get your answers for the questions. Also Read: Today's Latest IT & BPO Jobs Updates from TCS, Amazon, ITC Infotech & Others.